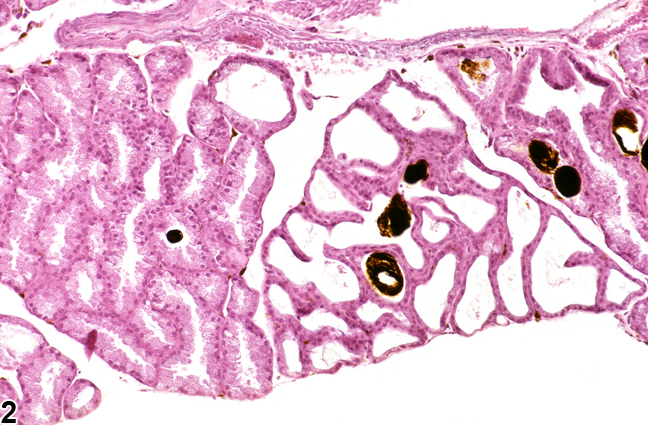 Harderian gland - Dilatation in a male B6C3F1 mouse from a chronic study. 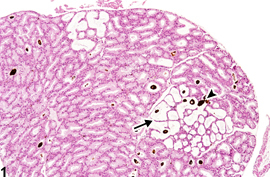 There are focal clusters of alveoli with dilated lumens lined by slightly flattened epithelial cells (arrow) some of which contain intraluminal porphyrin-pigment (arrowhead). Harderian gland - Dilation in a female B6C3F1 mouse from a chronic study. 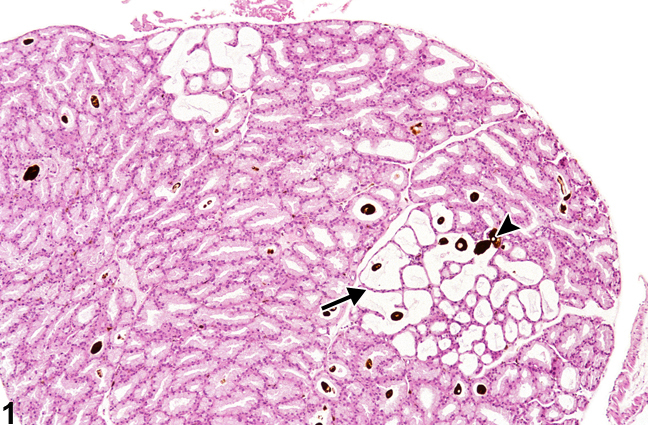 There is little interstitial fibrosis separating the dilated acini. Harderian gland dilation is characterized by focal clusters of Harderian gland alveoli with dilated lumens lined by slightly flattened epithelial cells ( Figure 1 and Figure 2 ); there is little if any associated interstitial fibrosis. Some dilated gland alveoli also exhibit intraluminal porphyrin pigment aggregates. Such dilatation is a common spontaneous finding in the Harderian glands of rats and mice but can also be induced by administration of various chemical agents. Harderian gland dilation should be diagnosed only if there are treatment-related differences in incidence and/or severity. When diagnosed, it should be assigned a severity grade. The associated porphyrin pigment should not be diagnosed separately (unless warranted by severity), but should be described in the pathology narrative. National Toxicology Program. 1993. NTP TR-402. Toxicology and Carcinogenesis Studies of Furan (CAS No. 110-00-9) in F344 Rats and B6C3F1 Mice (Gavage Studies). NTP, Research Triangle Park, NC. National Toxicology Program. 1999. NTP TR-469. Toxicology and Carcinogenesis Studies of AZT (CAS No. 30516-87-1) and AZT/α-Interferon A/D in B6C3F1 Mice (Gavage Studies). NTP, Research Triangle Park, NC. Satoh Y, Ishikawa K, Oomori Y, Takede S, Ono K. 1992. Secretion mode of the Harderian gland of rats after stimulation by cholinergic secretagogues. Acta Anat 143:7-13.